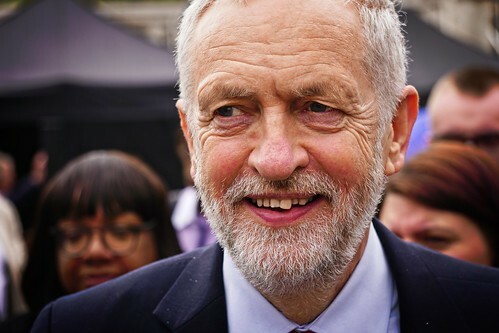 Right now in the UK there's an amazingly viral smear campaign against Jeremy Corbyn running across all mainstream outlets, which, from what I can tell, consists entirely of narrative spin and no actual evidence. The powerful elites who control British mass media have an obvious vested interest in keeping the UK government from moving to the left, so they advance the absolutely insane narrative that Corbyn is a secret Nazi. They just keep saying it and saying it like it's true until people start believing it without feeling any pressure at all to substantiate their narrative with facts. It's been jaw-dropping to watch. More and more we are seeing narratives about cyber-threats being used to advance reports of "attacks" and "acts of war" being perpetrated which, as far as the public is concerned, consist of nothing other than the authoritative assertions of confident-sounding media pundits. There was a recent NBC exclusive which was co-authored by Ken Dilanian, who is an actual, literal CIA asset, about the threat of hackers working for the Iranian government. The alleged Russian interference in the 2016 US elections is now routinely compared to Pearl Harbor and 9/11, despite no hard, verifiable evidence that that interference even took place ever being presented to the public. After the mass media's complicity in selling the Iraq invasion to the western world, we should have seen scores of people fired and changes put in place to prevent such unforgivable complicity from ever occurring again. Instead, no changes whatsoever were made to ensure that news media outlets never facilitate another disaster at the hands of secretive government agencies, and now these same outlets are allowed to promote world-shaping narratives on no evidentiary basis beyond "It's true because we said so." There's a consensus, agreed-upon narrative about what's going on in the world that is advanced by all mass media outlets regardless of what political sector those outlets market themselves to. Exactly what should be done about individual events and situations might vary a bit from pundit to pundit and outlet to outlet, but the overall "how it is" narrative about what's happening is the same across the board. This is the official narrative, and the plutocrat-owned media/political class has full control over it. We all know the official narratives, right? The US and its allies are good, the latest Official Bad Guy is bad. You live in a democracy where your vote counts and your government is accountable to you and your countrymen, just like they taught you in school. The two political parties are totally different and their opposition is totally real. The news man on TV never reports any falsehoods because if he did he'd lose his job, which means that the Russian hacking thing, the Syria thing, the 9/11 thing, all happened exactly as the government told us they happened. Iraq was maybe kinda sorta a mistake, but nothing like that could ever happen again because... mumble mumble cough... hey look what Kanye West is doing. "We have to believe that Russia is attacking our democracy because the TV and the CIA told us to." Let's consider a hypothetical scenario, though. Let's imagine a world where there were no official narratives. About anything. At all. What if there was no dominating elite class telling the public how they were meant to interpret events and situations? What if there was only the raw, publicly available information about what's going on in the world, and people individually interpreted that information for themselves? And what if they came to differing conclusions, and that was allowed to be okay? What if there was no elite class telling everyone that whoever doesn't believe X, Y and Z is a paranoid conspiracy theorist, a raving lunatic, and/or a Kremlin propagandist who needs to be shunned and silenced? What if all that were solely determined by the collective, without the control or oversight of any powerful, dominating class? You may find that your results in this thought experiment depend largely on where you place your trust. If you trust the dominating class more than you trust people as a collective, you probably find this idea terrifying. What if everyone starts thinking wrong thoughts and believing wrong beliefs? What if everyone decides that humans can fly and running with scissors is safe? What if everyone decides the Holocaust never happened and says "Hell, that means we get a freebie! Let's get our Final Solution on y'all! Yeehaw!" Without an elite class manipulating the way people think and vote into alignment with plutocratic interests, people would still be able to take actions in response to their best guess about what's going on in the world. The narrative of anthropogenic climate change for example would, in my opinion have a much better fighting chance of winning out in the marketplace of ideas if it were permitted to stand on the merit of the raw supporting data, rather than the manipulations of big oil on one hand and an elite faux liberal class convincing everyone that climate chaos can be averted by banning straws and buying a Prius on the other, and the collective would be able to democratically mobilize to avert catastrophe far more effectively than it can now. "All the suspicious behaviors of the mass media can be understood by considering the fact that mass media outlets are controlled by a few powerful elites who are acutely aware that they are vastly, dangerously outnumbered by the general population they exploit every day." Now let's consider another hypothetical scenario: what if, one day, everyone gets tired of official narratives? What if something happens and everyone gets fed up with being told how they have to think about the world by a thoroughly discredited media and political class? What if, to borrow from a popular Marxist meme, the public decides to seize the means of narrative production? This might look like the increasingly distrusted propaganda machine of a failing empire pushing an increasingly oppressed populace too far and too hard at some point, maybe in the direction of war, mass censorship or austerity, and losing control of the narrative in a nonviolent populist information rebellion.